Tomorrow is the official beginning of Carnevale in Venice. It will last until Tuesday, February 17 - Fat Tuesday or Mardi Gras which is the end of hedonistic, decadent behavior and the beginning of Lent, the long season of deprivation, fasting and reflection. The whole Carnevale experience in Venice freaks my husband out completely. He is haunted by the elaborate costumes and particularly the masks that create expressionless faces of revelers enjoying the festivities (at least I think they are enjoying it. The masks give away nothing). Needless to say, we won’t be going to Venice in February any time soon. But Carnevale is a big deal in Venice. Dances, pub crawls, concerts, formals - there is something taking place every day throughout the two weeks of celebration. While the celebrations are legendary in Venice, Carnevale is an event all over Italy. This is the Italian version of Halloween. Little ones get dressed up and attend Carnevale parties which usually take place in a park and during which lots of confetti is thrown. Of course, as is the case with any celebration, Carnevale has its own traditional sweets. Last year at this time, I told you about cenci, or rags of fried dough. 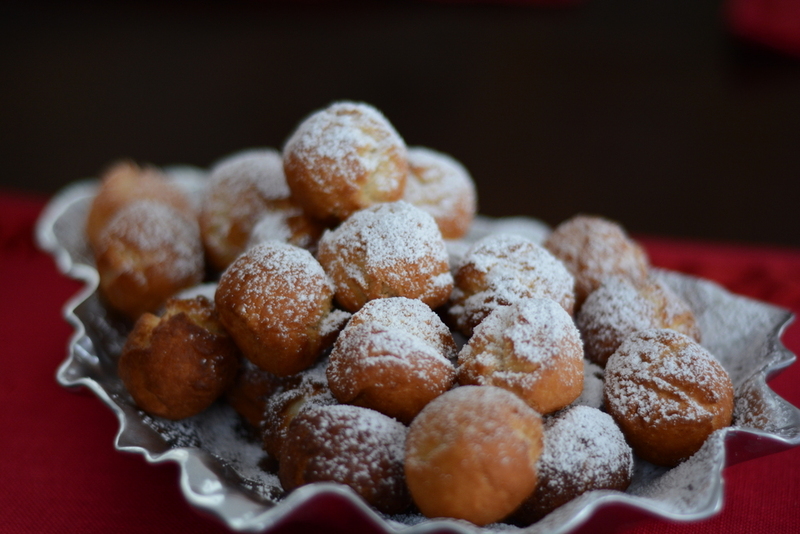 This year’s version of sweet fried goodness are castagnoli. These fried balls flavored with lemon peel and a little rum get their name because they look like chestnuts (castagne in Italian). Earlier this week we were snowed in and my thoughts turned to fried dough balls sprinkled with powdered sugar (a nod to the two feet of white powder that was outside my door). You can make the dough in about 10 minutes and fry these up in no time. Which is about how long it took for them to be consumed. Yes these are basically doughnut holes but try one and tell me if you ever had anything like this at Dunkin Donuts. I don’t think so. A couple of notes on cooking these. I use a much smaller saucepan than I had originally thought. The two cups of oil should come up at least two inches in the pan. The most important part of the cooking process is keeping the oil at 340 - 350 degrees fahrenheit. Higher than that and the outside gets too brown while the inside does not cook. If the oil is not hot enough, the outside just never gets that brown crispiness that really makes these perfect. I looked at a lot of recipes online but opted for what I thought was the simplest and in my opinion I chose wisely. So whip up a batch of these castagnoli this weekend and indulge before the long 40 days of denial begins.